An expanse of beauty: White Chocolate Raspberry Truffle peeping in at the bottom left corner; Ultimate Red Velvet Cake Cheesecake in the bottom center; Key Lime Cheesecake at the far right middle ground; Adam’s Peanut Butter Cup Fudge Ripple to the left, in the middle ground; Godiva Chocolate Cheesecake just above the red velvet cake cheesecake; Chocolate Tuxedo Cream Cheesecake at the top left; and Chocolate Raspberry Truffle just above the Godiva chocolate cheesecake. Following tea at the Drake Hotel, I was stalking along the grey Chicago streets when I looked up – and there it was! The Cheesecake Factory! I made a beeline for those oversized double doors, whereupon I entered a dimly but warmly lit paradise that smelled of dairy. Globby, cream-coloured decorations were affixed to the ceiling, as though blobs of cheesecake batter were suspended overhead. Golden sworls served as “rails” to separate booths from one another, and light golden rivulets swirled about on the floor, as though cheesecake batter had gone rogue. Roundness, movement, and flow were at the core of the décor. Swirly golden decorations. Being inside the Cheesecake Factory is like being eaten by a giant cheesecake. I wondered quite seriously if the decorator for the restaurant had a subconscious desire to return to the womb, as it was very womblike in there. I’m having trouble with the fact that I just compared the inside of a womb to the inside of a cheesecake. As I stated in the caption, it felt very womblike in there. But I figured that with cheesecake at my side (and over my head! ), I could stomach anything. It was high time to start ordering. 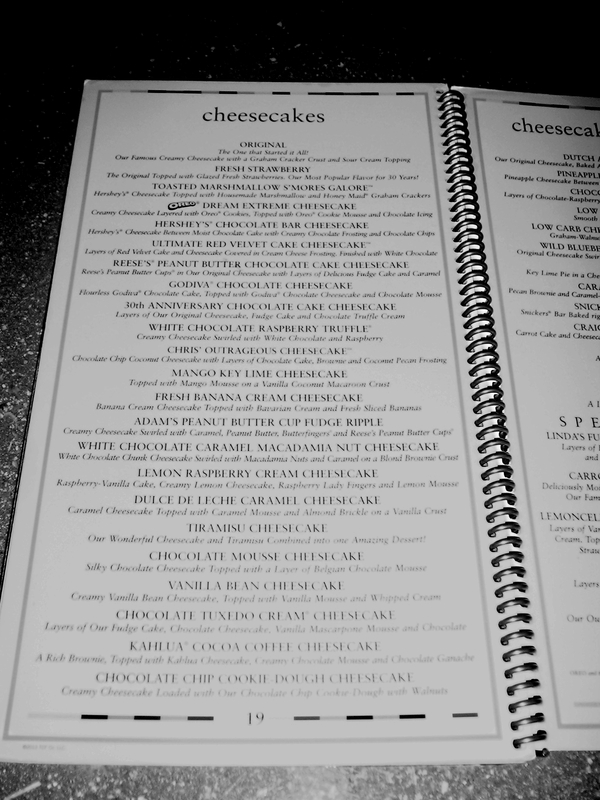 The cheesecake menu, which carries over to the next page. No joke, I nearly ordered one of each! I thought it would be only polite to warn the server that I planned to order several cheesecakes to try. By the time I’d listed the fifth of seven cheesecakes, his shock was morphing into grudging admiration and with a gleam of pointy white teeth, he was gone – not even having written anything down. Surely he’d fluff the order – but no! This dude had it going on in the short-term memory department. More cheesecake goodness, this time from a different angle: Key Lime Cheesecake at the foreground; Ultimate Red Velvet Cake Cheesecake to the left front foreground; Godiva Chocolate Cheesecake in the middle ground; Adam’s Peanut Butter Cup Fudge Ripple in the distance to the left; the Chocolate Tuxedo Cream Cheesecake at the very back; and the Chocolate Raspberry Truffle at the top right. I took the tasting of each of these very seriously, even going so far as to make notes. My final verdict is that The Cheesecake Factory makes excellent cheesecake, generally speaking. There were high points, and there were low points. Since I’m in an ascending kind of mood, I’ll start with a low point. Red velvet cake cheesecake, with its enticing white chocolate curls visible on the outer edge of the slice. The presentation was lovely with all of the cheesecakes, and the red velvet was no exception to this rule. The cheesecake layers were good but not exceptional. The red velvet cake layers, however, were chewy, dense, and oddly flavourless; they actually dragged down the flavour of the cheesecake layers. The cream cheese icing was also oddly tasteless. While the white chocolate curls on the outside edge of the slice added a nice crunch, they weren’t enough to salvage this massive disappointment. I think this is the kind of dessert that should only be made fresh and should never be frozen; I have a strong feeling that freezing is partially (but not wholly) why the cake layers were so tasteless and chewy. If I hadn’t made my own version of this at home several months ago, thus learning firsthand how much potential the pairing of cheesecake and red velvet cake has to offer, I don’t think I would have been as disappointed. I’m muchly surprised that this is one of The Cheesecake Factory’s most famous desserts, given that it is so lacking in taste and texture. White chocolate raspberry cheesecake, with dark chocolate crust. This is the best shot I have of this slice, unfortunately, but at least the whorls and ripples of raspberry are visible. Due to the mild flavour of white chocolate, this cheesecake was deceptively dull when consumed cold. Even the rivulets of raspberry running through the cheesecake could not boost the taste or add excitement. However, when eaten at room temperature, this cheesecake was a pretty phenomenal pairing of white chocolate and raspberry: It zoomed from “Meh” to “Wow!” The white chocolate curls on top added both a pleasant crunch and a boost of white chocolate flavour. I noticed that this cheesecake wasn’t as smooth in texture as some of the others, but that is a mild complaint. The dark chocolate crust seemed dubious to me at first, but it is a fantastic complement to the sweet white chocolate flavouring. Eaten by itself, the crust was quite tasty and nearly stole the show from the cheesecake. I must admit, white chocolate and raspberry aren’t a favourite combination of mine, but for those who like these two elements together, this cheesecake – at room temperature, of course! – is for you. The tuxedo cheesecake slice came with such an artful presentation of white and dark chocolate ganaches “woven” together on the plate. I couldn’t stop staring at it. They say we eat first with our eyes, and the attractive presentation made this cheesecake all the more appealing. The ringing, chocoholic-pleasing answer to the tuxedo cheesecake! The texture of this cheesecake was a little different to that of the tuxedo’s; it was as though this cheesecake incorporated more chocolate into the batter, and given the intense chocolate flavour of this cheesecake, that would make sense, now, wouldn’t it? The cheesecake layer was more semisweet than dark in tone, while the flourless chocolate cake layer was darker and denser. The tangy chocolate mousse was dreamily smooth. Cocoa powder dusted on top created a faint but nonetheless notable undertone of darkness. The Godiva cheesecake was one of my favourites. Adam’s Peanut Butter Cup Killer. I nearly had to hand in my peanut butter & chocolate lover’s card with this bad boy! It proved to be so dense, rich, and heavy that I couldn’t eat more than a couple of bites. That is really saying something, because I can usually chow down on dense desserts. It’s no wonder this was such a killer: peanut butter cups, butterfingers, and caramel are swirled in a vanilla cheesecake and topped with an outstanding peanut butter buttercream icing as well as chopped up bits of peanut butter cups and butterfingers. Despite its richness, I found it to be a gorgeous marriage of peanut butter and chocolate, balanced out by the vanilla cheesecake; and the chopped up candies added a beautiful crunchy texture. The caramel flavouring wasn’t too intense, either, for which I was grateful; I have a low tolerance for caramel. The chocolate crust was perfect with this cheesecake. I fell in love with the peanut butter buttercream icing sworled on top! How I wish I had the recipe. It’s the best one I’ve encountered to date: thick but pliable, sweet but a little salty from the peanut butter. As I said, I could only finish a few bites – but I loved this cheesecake! Chocolate raspberry cheesecake. My apologies for the terrible shot! Somehow, when I was photographing everything in the restaurant, this slice got overlooked. Sadly, I didn’t get any good shots of this cheesecake; and it turned out to be my second favourite one out of the bunch! Raspberry coulis (at least, I think it is coulis) is swirled into a semisweet chocolate cheesecake and topped with chocolate mousse. Rich chocolate icing is piped atop the cheesecake and milk chocolate curls are sprinkled over the whole thing. I was in love after the first bite. The texture was heavenly – creamy, dreamy, soft, yielding. The chocolate flavouring was perfectly balanced with that of the raspberry; the chocolate icing on top was a sweet counterpoint to the semisweet cheesecake. The chocolate mousse itself did not boast any raspberry flavouring, which I liked, because I felt that if it had done so, the raspberry flavour would have been overpowering. I loved this thing cold, so when it was allowed to warm to room temperature, I was not a bit surprised when it blew my socks off. This is a cheesecake I would happily eat every day for years. Key lime cheesecake, with a lime slice on top. This is my favourite of all the cheesecakes I tried. I am a die-hard fan of key lime pie, and this was like key lime pie on crack. The texture was so much smoother than key lime pie, the tartness a bit more nuanced due to the cream cheese. This key lime pie cheesecake is what key lime pie aspires to be and doesn’t quite achieve. I’m officially converted from loving key lime pie to loving key lime cheesecake even more. (Though I’ll always have a soft spot for the pie version.) The graham cracker crust – the only crust that has any business consorting with key lime anything – was sweet and went perfectly with the cheesecake filling. Sweetened whipped cream, swirled atop the cheesecake, was the perfect counterpoint to the cheesecake’s tartness. Plain and simple, this was a key lime cheesecake done right. I’m thrilled that I was able to visit a real, live Cheesecake Factory. Truth be told, eating at The Cheesecake Factory was a highlight of my trip to Chicago. What can I say? I’m easy to please. That the cheesecakes, by and large, actually lived up to the hype that surrounds them just made the experience all the sweeter. 😉 Joking aside, I, as a baker, am blown away by this chain’s business model. It has managed to make mass-produced dessert into an amazing experience. (With the caveat that they need to fix their red velvet cake!) I’d love to pick the brains of those who started this business and see where they began, where they intended to wind up, and what they think of where they are now. I wonder, where will The Cheesecake Factory be in ten years? In my back yard? In my dreams! Another shot of bags filled with goodies!